Well the weather is just now turning a little colder, a reminder that winter will be here soon. The clocks have now been set back for daylight savings time. So now it’s time to begin closing down your hives in preparation for the long winter months ahead. If you have feeders on, now is the time to remove them. Pour any unused sugar syrup into a container and tighten the lid. This can be used for a feed in the spring. You removed all your honey supers during the feeding period, so if you held back a super to feed to your bees for winter than now is the time to put it back on. You will have completed your Varroa treatment by now and with little or no brood your bees should be fairly Varroa clean. Ventilation is important at this time of year. Condensation within a hive is dangerous to bee heath so take steps to avoid this. Make sure your hive is tilted slightly, the front lower than the back. This way if any water collects within your hive it will run down the inner walls towards the front of the hive and drip out through the entrance. 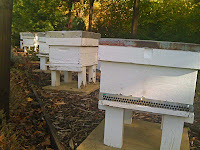 Bees cluster to keep warm, breathing and consuming nectar during the winter. So water vapour is produced within the air. We need to make sure this vapour can escape. A little trick is to place stick matches on the upper four corners of the brood box. Place your crownboard on top of the match sticks. These leaves a tiny gap all around the top area just big enough to allow a little air flow circulation. Air enters via the entrance and up and out through your provided gap space. It’s too small to allow wasps or mice into the hive. Which brings me to mice! Make sure you have your mouse guards in place. Remove the entrance block and put the guard over the entrance. See our earlier article explaining this. If you have woodpeckers or badgers in your area then cover your hive with chicken wire. You can secure it under the legs of your hive stand or tie it in place. Woodpeckers will not only damage the hive by putting large holes through the sides of the hive, but of course will slowly eat their way through your bees, picking them off one by one. Badgers will just knock your hive over like a tank and eat the lot. Winds pick up at this time of year so securing your hive roof is a must. If you have a hive stand loop a piece of rope over the roof and through the stand to secure it in place. Any tall grass/vegetation should be cleared from around your hive to avoid a collection of water vapour near the hive. Good outer ventilation is important as well. Now your bees are clean, fed, well ventilated and happy! You can now get to bottling all that honey you collected during the year!